The past four days have been super exciting. I love watching the Olympics, especially our incredibly talented women’s gymnastics team. And who didn’t love the Queen’s entrance at the opening ceremonies? As you gather with friends to cheer on your favorite athletes, you might find yourself browsing the web for creative ways to celebrate. I’ve seen so many cute Olympic-themed pins on Pinterest lately, but most of these adorable ideas have been geared toward the kiddos. Since I’m not quite there yet, I thought I’d put something together for us ladies and gents. If I was going to throw a party in honor of the games, this would be it! 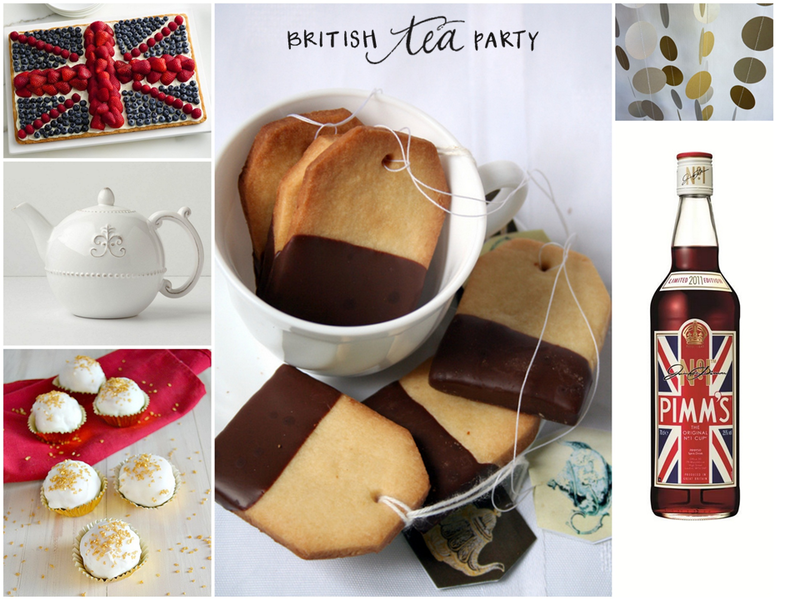 Since the big event is being held in London, it’s only appropriate to throw a grown-up tea party in honor of Union Jack. Pick your favorite blend and serve high tea with these adorable chocolate-dipped shortbread cookies. You can’t go wrong. If tea isn’t your cup of… tea (sorry, I had to), then sip on Pimm’s, a traditional English summer drink. Follow this link for an easy recipe. Or for more guy-friendly fun, gather beers from around the world to represent the teams (like Double Diamond from England, Guinness from Ireland, Corona from Mexico, and obviously your favorite home-grown brew too). If you’re crafty, whip up some gold, silver and bronze decorations or purchase the darling garland below from Fabulously Handmade. Sources: Union Jack Fruit Pizza from Betty Crocker ~ Shortbread Tea Bag Cookies from Le Petrin ~ Gold, Silver and Bronze Garland from Fabulously Handmade ~ Fleur De Lys Teapot from Anthropologie ~ “Go for the Gold” Pineapple Truffles from Kitchen Meets Girl ~ Pimm’s photo via The Handbook, you can purchase Pimm’s at Spec’s or your local liquor store.